One of the most exciting times in a pregnancy is, you guessed it, the baby shower—a sort of culmination of it all. Gathered together with friends and family, it's all about celebrating the parents-to-be and, of course, the baby. And as such, it's no surprise that the expectant parents want to look and feel their best. That's why we've gone ahead and curated an edited of the chicest, most stylish maternity dresses for a fall baby shower. 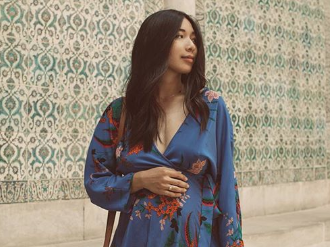 From a floral printed maxi dress to a chic, mustard yellow one-shoulder midi, we're certain parents-to-be will find a fashion-forward pick below that suits their personal styling preferences (and their growing bump too). And because a baby shower is such a special event, we're definitely not against splurging a bit. Plus, many of the options below can be worked into one's day-to-day maternity wardrobe as well—so in other words, they're worth it. Now read on to see and shop the best maternity baby shower dresses for fall. Next up, shop our favorite fall maternity dresses to wear once the new season arrives.